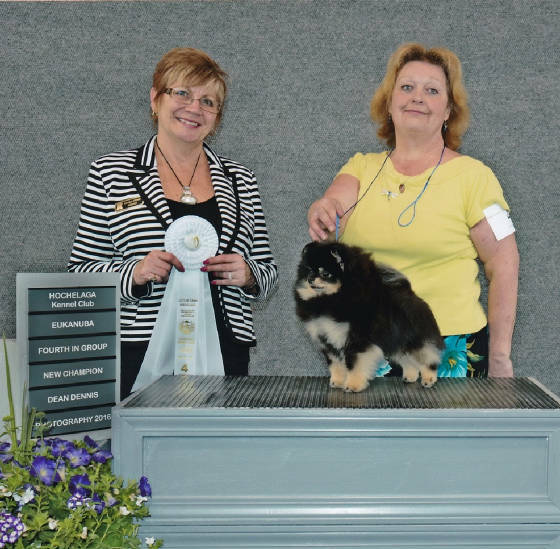 Home | Girls | Boys | Show News | Available | Champions "Then & Now"
My name is "Jen Hryniuk"
Best In Show, Best In Specialty Show, Best Puppy In Show, Plus Many other Group Wins in Canada & the United States, in this country & many other Countries with other owners / co-owners. On December 20th 2014 my life was devastated and changed forever when a Tragic Electrical Fire in my Home while I was not there - Claimed the lives of All 25 of my Jenuwane pomeranians from the age of two weeks old up to 7 years old, this impacted me so Deeply that I have now decided that it is Time for my after 45 years of breeding these wonderful dogs to give this up and pass the torch to others that have the passion that I once had and LOST on that fateful day... My Heart was Broken and I tried to buy a few more poms and show them and get the feeling back, I just do not have the joy I once had doing this and instead it is a constant reminder to me of all my Kids Lost in the Fire... So it is with a VERY Heavy Heart and after Much thought that I have decided to Stop Breeding and will Show my Champion boy "Eager" only as he is the only one I now have and will try to find Peace and Happiness in the Future with only one and perhaps two poms. I may decide to get another female and try my hand at Breeding again, but time will tell on that. I want to Thank everyone that stood behind me through this terrible time... you are all very special to me and I wish you all the BEST life has to offer. Hugs to ALL of You!! !